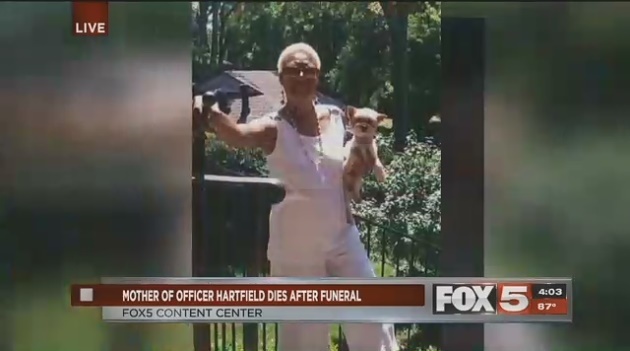 Two days after Las Vegas Metropolitan Police Officer Charleston Hartfield's funeral, his mother died from a heart attack. Hartfield died in the Route 91 concert shooting. On the day of his funeral, his mother, Sheryl Stiles, suffered a heart attack, fell down an escalator, and died two days later. Lewis Stiles said he came to Las Vegas from Louisville to support his sister Sheryl Stiles for a somber occasion, attending the funeral of her son Charleston Hartfield. Hartfield was one of the 58 people killed during the mass shooting at the Route 91 Harvest Festival. Sheryl was put on life support, but the Clark County Coroner confirmed that she died two days later, after suffering from pulmonary arrest and acute cardio infarction. Her family said they believe she died from a broken heart, Fox5 reports.